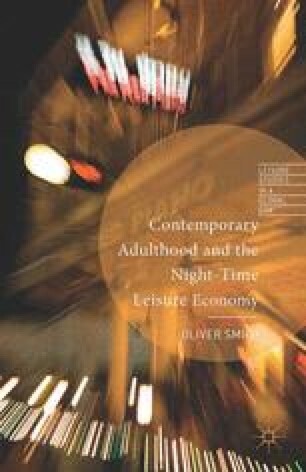 This chapter aims to examine the contextual factors that contribute to the experiences of those consuming within the night-time economy (NTE). The past four decades have borne witness to unprecedented levels of socioeconomic change within Britain and beyond. The crumbling of traditional forms of industrial employment, the shift toward an economy based on leisure and consumer and financial services rather than production combined with the myriad complexities, risks and challenges facing those growing up, learning, working and surviving under conditions of late modernity are comparable in magnitude and significance to the agricultural and industrial revolutions of the eighteenth and nineteenth centuries (Hobsbawm, 1976, 1996). At the time of writing, we find ourselves half a decade into the worst financial crisis in living memory, an event that exacerbates the consequences, experiences and anxieties that constitute life under liberal capitalism. Despite the apparent wholesale collapse of the neoliberal project, the absence of any alternative way of organising the global economy appears to have cemented liberal capitalism as the ‘least-worst’ option. For the majority, the apparent indestructibility of the neoliberal project contributes to a feeling of impotence, characterised by political apathy and inertia, alongside an acceptance of capitalist realism (see Fisher, 2009).